LetsLetAlgarve is about helping you to find your perfect Algarve holiday home from home in the absolutely beautiful and popular Algarve region of Portugal. We put you in direct contact with the owners of Algarve apartments and villas, or with their designated local manager, who can provide the advice you need to match your Algarve villa rentals requirement, in the right location, and at the right price. So if you are looking for a great selection of self catering Algarve villas and apartments to rent direct from the owner, without added booking fees or commissions, just start here. 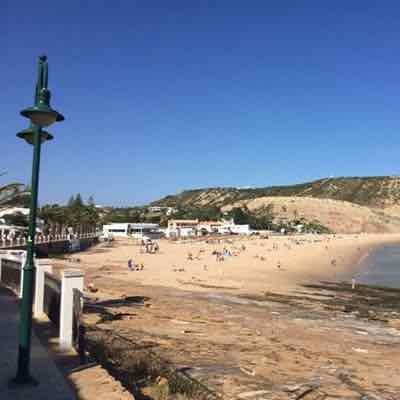 You know that you're always going to get a great deal on Let's Let Algarve by booking your Algarve holidays direct with the owner, but here are some even sweeter deals if you are flexible in your dates or can travel last minute. The most long established favourite for all round holiday entertainment is the Central Algarve. Fabulous beaches, water parks, marinas, magnificent golf courses & tennis centres. Plenty of nightlife in bustling Albufeira but with a flavour of traditional Portugal in Albufeira Old Town. 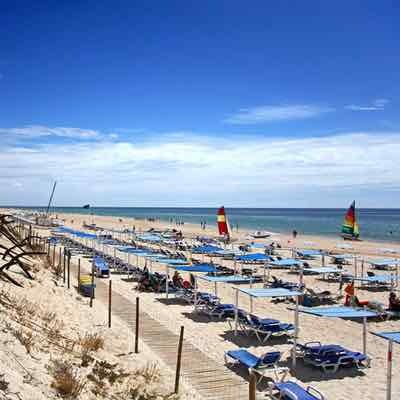 Stretching from Faro to the Spanish border, the East Algarve boasts long sandy stretches of safe and unspoilt beach. The Rio Formosa natural reserve famed for its birdlife, picturesque villages, and the historical town of Tavira. Perfect for a peaceful getaway. The Western Algarve offers a middle ground. The historical port town of Lagos, its marina, great restaurants and night life. Family friendly low rise resorts with safe, sandy beaches, between stretches of ruggedly beautiful rock formations. Watersports, and excellent surf towards the less populated west coast. For self catering holidays Algarve accommodation can broadly be divided into two types - apartments and villas, although we will also make the distinction here and add a third, that of "cottages", which we feel can stand on its own two feet as a category of accommodation. Starting with the first accommodation category, Algarve apartments generally cater for smaller groups, starting with studios or one-bedroom apartments to suit couples, and going up to 3 or 4 bedroom apartments sleeping up to 6 or 8 people. As apartments are generally part of a larger apartment complex, they won't normally have their own private swimming pool, but a pool which is shared with other properties instead. And normally, an apartment won't have its own garden, although will often have an outdoor seating area and / or balcony. The term Villas is used to describe detached, generally larger properties, although it is possible to rent small villas with two or three bedrooms to cater for smaller family villa holidays. Most private villas in Portugal will be set in their own garden, with plenty of space to enjoy the sunshine or eating outside, and villas in Algarve with private pool provide a safe environment for families of all ages. And finally Algarve cottages - very hard to describe really, but you know what we mean right? Cute, cosy, small, probably in the countryside, characterful - it's probably one word that means pretty much the same wherever you come from - you KNOW what you're looking for! WHY ARE WE DIFFERENT FROM OWNERS DIRECT, HOMEAWAY & HOLIDAY LETTINGS? Quite simple really - the hint is in the word "direct"! Many of the original world wide direct booking sites have been purchased by larger companies, and then in turn by the few even larger ones, who seek to dominate the holiday rental market. (For example Expedia which now owns Owners Direct and HomeAway, who had previously bought out Holiday Rentals) These companies are using their prominence to alter the direct booking model to become online agencies, not only charging the villa owners to list, but taking the opportunity to add hefty percentage based fees charged to the holidaymaker for booking through the site. Removing direct contact with the owner is done under the guise of ‘safety’. But how safe is your booking, when none of the properties listed have undergone any checks? How suitable is the accommodation for your party, when the automated online booking system cannot discuss the villa and area facilities with you? And if you can get hold of one, how can a call centre employee on one side of the world have any knowledge regarding a villa or destination located on the other side? The best qualified person to answer your questions is surely the home owner. At the same time, how protected is the property owner, when they have had no direct communication with the party who has booked their home? A quick look at the reviews of Owners Direct or Homeaway on sites such as TrustPilot throws light on the current level of distrust in automated booking of owners and holidaymakers alike. Here at Lets Let Algarve we have gone back to the basic principle of putting holidaymakers and holiday home owners in direct contact. At a fair annual fee to owners, our Algarve rentals listings provide full details of the holiday property, together with direct contact information, allowing the holiday maker and owner to achieve a best match in terms of a great holiday venue at the very best price - the true owners direct price, without commissons or booking fees. We have chosen to concentrate on building a comprehensive catalogue of private Algarve villas and apartments within this popular region of Portugal, where we have local contacts who know the region, and know the properties. All our owners direct Algarve holiday homes listed are cared for locally either by the owners of villas in Portugal, or by their designated local managers, working to ensure the smooth running of your holiday. People who can provide travel advice, or answer questions like "Is it a villa with a private pool? ", "Is that swimming pool heated, year-round? ", "Is it near a beach?" or "Do we need a car? ".